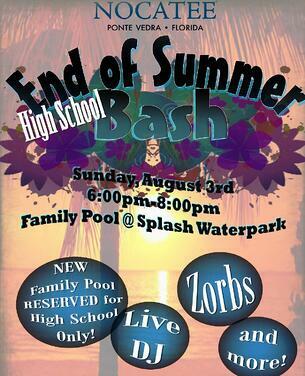 Nocatee residents (grades 9-12) are invited to Splash Water Park on Sunday, August 3rd, for an "End of Summer Bash!" 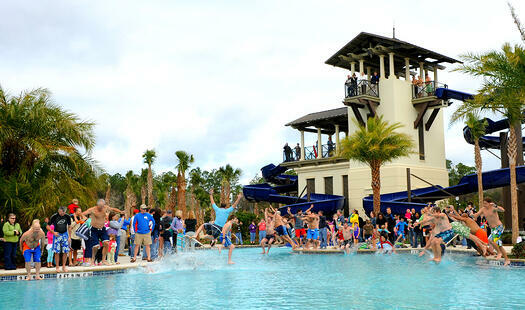 From 6:00pm until 8:00pm, Splash's new Family Pool will be exclusively reserved for attendees of this special event. With a large pool, spray-ground, deck space and even more covered seating areas, this expansion is a great oasis during Florida summers. High School residents are encouraged to join Nocatee neighbors and fellow classmates in fun games on land and in the pool. There will event be a chance to try out one of the community's new "Zorbs." A professional DJ will also be present. Some of the best memories are made over summer break, and that's why Nocatee is bringing students together for a chance to make even more memories as the beginning of the 2014-2015 School Year draws near. Another reason Nocatee attracts such a variety of home buyers, is that community events and activities are offered for every type of resident. From adult socials, to teen nights, to kid's crafting events, there is always something for everyone to enjoy right at home. If you would like more information on this master-planned community, stop by the Nocatee Welcome Center or call 1-800-NOCATEE.